I am not a fan of the Twilight series. In fact, I have never read the books, nor have I seen the movie. But I do love the countryside surrounding the quaint, small towns of Forks and LaPush, the places where the story is told. The forests and winding roads that open up to the beauty of the beach are tranquil and remote. Being there simply melds my heart into serenity. 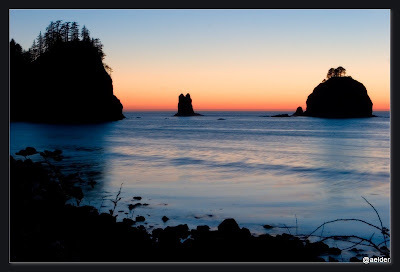 Visits to the beach at LaPush are best planned so the sun can be viewed as it sets. Brown pelicans, great blue herons, and hundreds of gulls are only a few of the birds that can be observed from the shore. Tiny islands dot the shoreline. Low tide reveals a rocky shore, and high tide brings waves close by, making observation of sea otters and other creatures easy and close. This point, one of the most western on the Pacific coast, speaks of serenity to all who take the time to stop and observe. Many tasty picnic lunches have been shared from a landing near this beautiful coastal spot. And summer, sweet summer, is the best time of all for such a delightful repast. Sounds like a very lovely place to visit! Thanks for taking us along for a visit today. I have not been to LaPush, but it looks beautiful. Oh I just love the coast no matter where. I think I am past due for a trip there. The picnic at the coast sounds so delightful. It is soo beautiful there xoxox Clarice-who loves the books, just saying !!! I love the shape of the island to the right with the trees on top. The sunsets must be magnificent at this spot. I refuse to read the Twilight series but my family has been camping and staying at La Push since the 40s. It's my favorite place on the entire planet! My soul needed to see that picture tonight... thank you!